Use the Syringe Disposal for syringe and needle disposal. Includes safely clips and stores up to a two-year supply of syringe needles. Simple clipping action snips off and retains needles within clipper. The syringe disposal unit meets government regulations on proper method of in-home syringe disposal. Compact and portable. Locks closed for travel and storage. The syringe disposal unit safely holds up to 1500 needles. Husband diabetic, takes insulin for maintenance x1 daily. Takes insulin 1-3 x daily per sliding scale as needed. Was used to remove needles from syringes. Lasted about 3 days and now needles only bend. Poor quality. by Annalee from Grottoes, Va. Safe &amp; EZ to use clipper--A+! Lightweight. Easy Storage. Safe. Durable. Good Value. 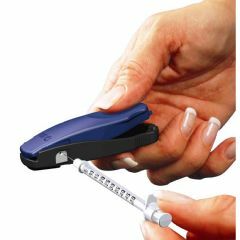 I keep the needle clipper alongside my glucose monitor as that is where I inject my insulin. I feel SOO relieved to clip the metal tips off the used syringes, thereby making them UN-reusable. I read my newspaper &amp; incidents of meth labs &amp; heroin use worry me. I wish I could destroy the needles entirely, but at least this renders them useless. And that is a HUGE plus. Thanks for a great product; would definitely recommend. Not for lancets. Small gauge only (< 23g). I didn't notice a description before I ordered. This clipper won't handle 23g or larger needles. It's only for smaller needles. Lightweight. Easy Storage. Good Value. Safe. After the lancet is used, just clip the needle end and throw away the rest away, since needle is clipped it is no longer is a safety issue and since the needle ends are so small it can be used over and over until full. So small can be stored in testing pouch that came with my meter. Safe. Sturdy. Easy Storage. Lightweight. Durable. High Quality. Good Value. safe with child in house. Medical Professional. Caregiver. Diabetic Spouse and child. Husband disabled. Allows for syringes to be placed in the trash. I used the same one for more than 2 years for son and husband. We have used these for approximately 4 years. You can throw the syringes away after clipped and the unit when full can also be thrown away. It holds approximately 750 to 1000. Sharps (like syringe needles) should be disposed of in a special container for biohazards. Your local pharmacy or doctor's office will have these. Don't just toss them in the trash. how many times I can use this clip?